Most of the campaigners have left with only two remaining. This last two months have been fruitful but sometimes challenging. With forty or more people here it is difficult to keep everything at a normal pace. However, we maintained our normal studies and the Lunsala and Konkwa congregations have continued to grow. The gospel is powerful and lost souls continue to respond to it. Tomorrow I am going to challenge more with a lesson about their "World View." Lord willing it will at least cause them to think about their decision to either follow the Lord or the witch doctors and Satan. 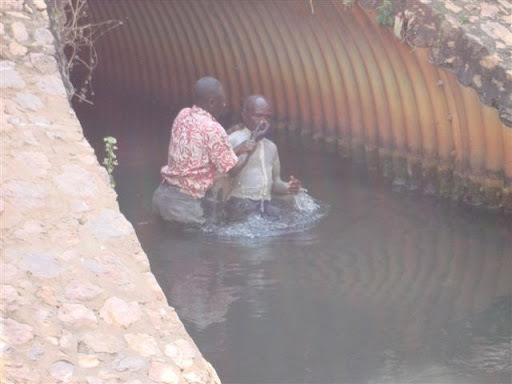 The "Mudala" (old man) pictured in his baptism is Jackson Mpamvu. He has been attending our Lord's Day service for some weeks and he made the decision to be baptized. When I explained that he is doing what all members of the Lord's Church have done since the Church was established he had the biggest smile. This is what it is all about, one soul at a time. Today Aaron Chilembe and I visited a large village some 20 kilometers from Lunsala. Some ladies from Muyashi asked us to come and preach at their village. We went today to visit the headman but could only find his assistant. He said we should come back on Wednesday and the headman would give us his okay to preach in his village. We expect several people to be there. Lord willing, in the near future there will be another congregation in our area. Rita and I are grateful for your prayers and for allowing us to be here doing what we like to do. We pray that God will continue to bless you as you labor.